FROME Town Council has hailed its first ‘Love Your River Day’ event a success, with many people enjoying a packed line up of activities and meeting some special guests. Frome Angling Club shared tips and advice with beginners to help them with their fishing techniques, whilst experienced anglers were able to pick up tips from demonstrations by international fly-casting veteran Atsushi Hasegawa. Frome Canoe Club showed the crowd their skills and provided paddling sessions on the water. 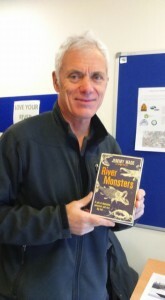 Elsewhere, fans of television show ‘River Monsters’ got to meet extreme angler and biologist Jeremy Wade. He was on hand to chat with fellow anglers and he signed copies of his book. Also at the event were a number of stalls providing information; the Wild Trout Trust, the Environment Agency, Bristol Avon Rivers Trust, Friends of the River Frome, Hunting Raven Books and Frome Town Council were all highlighting things to do along the river, as well as ideas and projects for Frome. Those who went along to the event had the opportunity to find out more about the project and could sign up as volunteers to be involved with the plans.